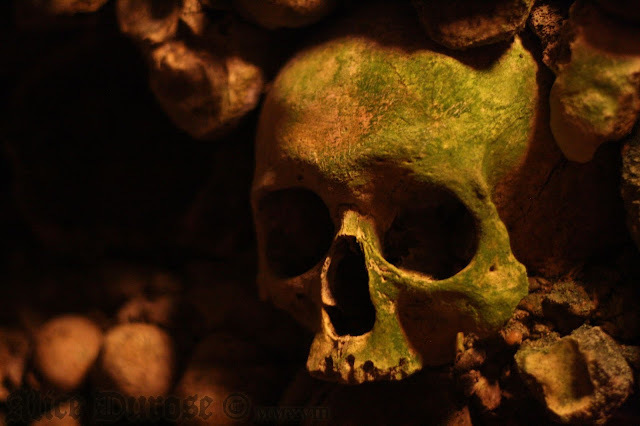 Since my initial visit to the Paris Catacombs a number of years ago I have long dreamed of returning to this breathtaking, utterly unique place. Finally now our road trip was taking us through Paris providing the perfect chance to return to the Empire of the dead. 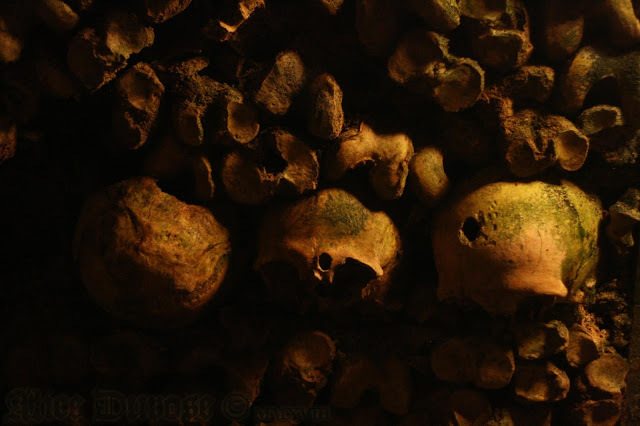 Unfortunately the timing of the trip was not the greatest, and for months on the run up to our visit the catacombs workers were on strike, meaning it was closed to the public for some time. 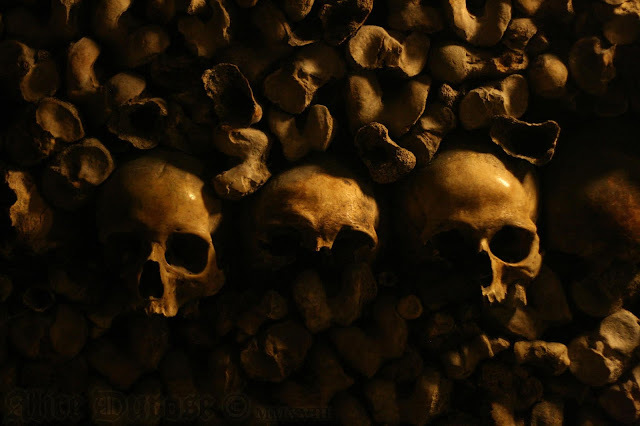 As the time for our visit crept nearer, the dispute was still unresolved, and I began to fear there was no chance of making it to the catacombs this time, a very distressing thought as it was one of the main reasons we were stopping in Paris at all and to be one of the highlights of the trip. 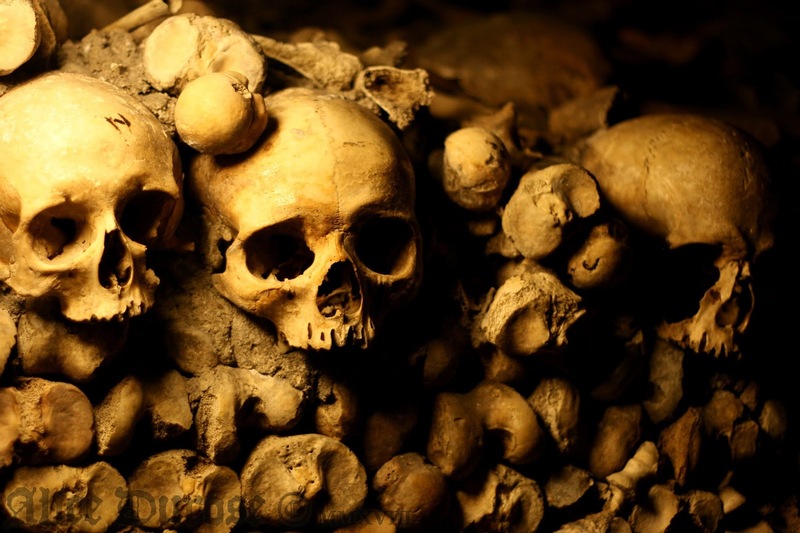 By some miracle our luck was in, the Catacombs reopened for business just in time. We arrived early in the morning to join the infamous line to enter, I decided against pre-booking due to the uncertainty created by the strike, and on my previous visit I waited just under an hour to gain entry. Though after over 3 hours in the baking hot sun with little to no shade I certainly regretted it. The amount of time spent waiting compared to actually absorbing the atmosphere of the catacombs did leave a bit of a bitter taste in the mouth, which was a real shame. And in the few short years since I last visited the world has changed. And not necessarily for the better. The selfie reigns supreme and the selfie stick is the sceptre of every self obsessed idiot roaming the planet. I remember a couple of annoying people posing for photos with the remains and one woman talking loudly on my first visit. But this time the catacombs seemed full of people hell bent on destroying the tranquil, uniquely beautiful atmosphere which I know this place possesses when unpolluted by the living. As ever I tried to block out these distractions and focus on capturing the macabre beauty that lays within these tunnels. 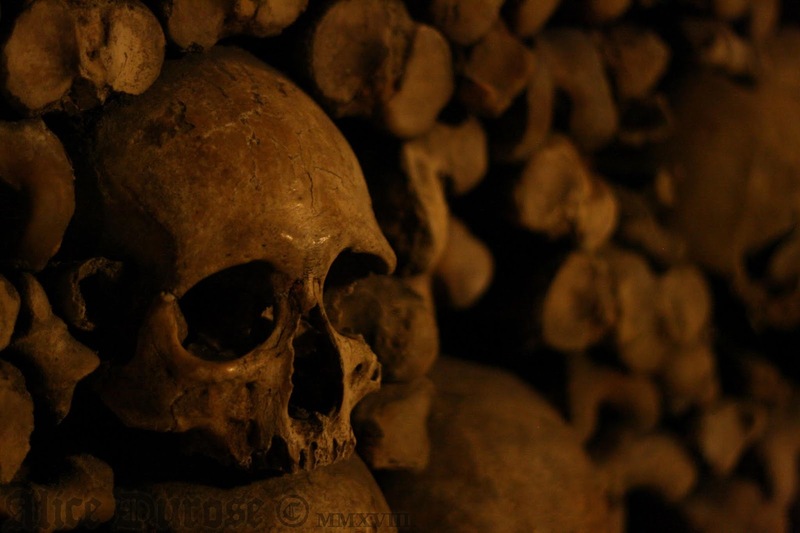 Eventually I blocked out those around me and immersed myself in the Catacombs once again. I couldn't decide if it was an illusion, my memory playing tricks on me or in fact the truth but the death and decay in these tunnels seems to be a living, breathing entity. Since my previous visit more water drips than I remember, moss grows here and there coating some skulls in a macabre green film as if claiming them back for nature and bones are damaged, displaced and some clearly the victim of meddling visitors fingers. The neat order of death I witnessed previously feels a little more decrepit, and little more fractured and ebbed away by more time and further decay. 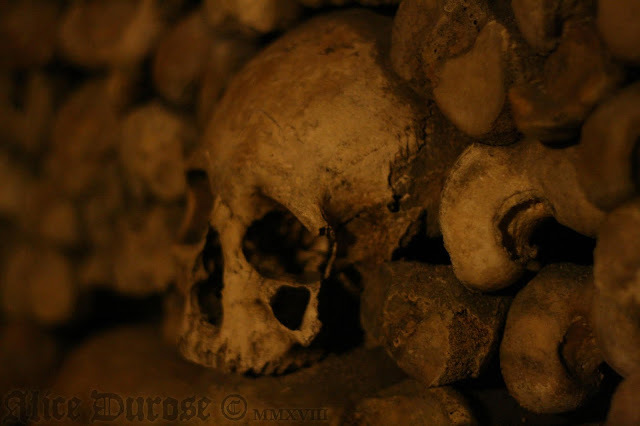 This was a strange idea to me, as I had initially viewed these bones picked clean by time and entirely skeletal upon their arrival at the catacombs as the end product of decay, when I suppose in reality even in these tunnels the remains will continue to deteriorate and eventually become dust or brittle fragments if left uncared for. A strange thought, I don't know why it had never occurred to me previously. Ultimately I dream one day of wandering the empire of the dead alone. The only living soul paying tribute and admiring all these beings, wondering what lives they lived as I wander through the tunnels. 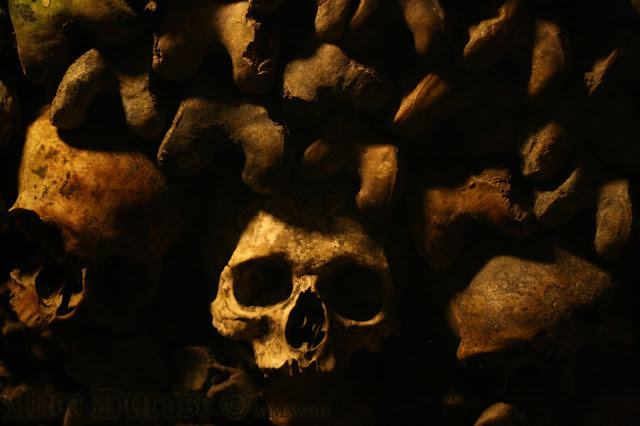 As ever the Catacombs are a truly unique place with a pure beauty and a staggering effect when you see the thousands upon thousands of bones delicately lining the tunnels. I hope if I one day return to the Catacombs once more sections which were previously accessible (and are now not) are open again, such as the quarry men's carvings. And I hope people will have learned how to show a little more respect and give the dead the dignity they deserve when visiting their great empire.